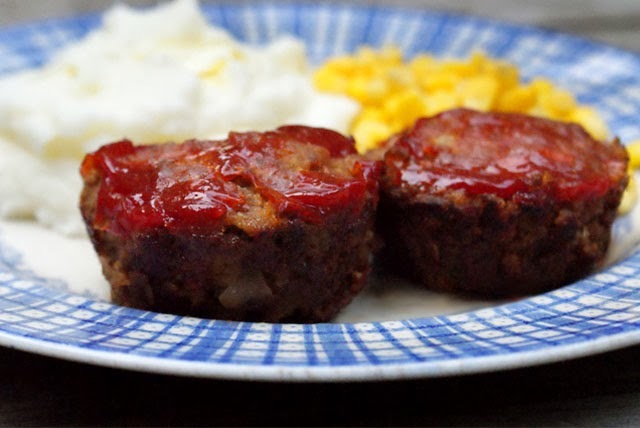 Meatloaf Muffins are perfectly moist little meatloaves packed with fresh chopped veggies that are baked in a muffin tin in just 25 minutes. Whenever I think of meatloaf, the old movie A Christmas Story comes to mind. Remember the scene in the kitchen when they are eating dinner? The little brother chants, "Meatloaf bleatloaf, I hate meatloaf." Gah, I love that movie. 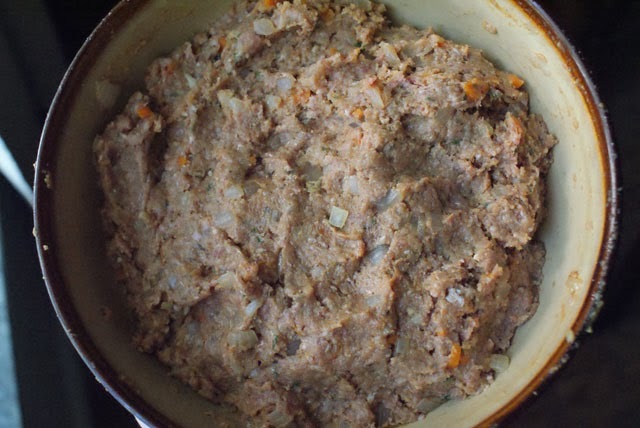 I do not, however, hate meatloaf. What's wrong with that kid, right? 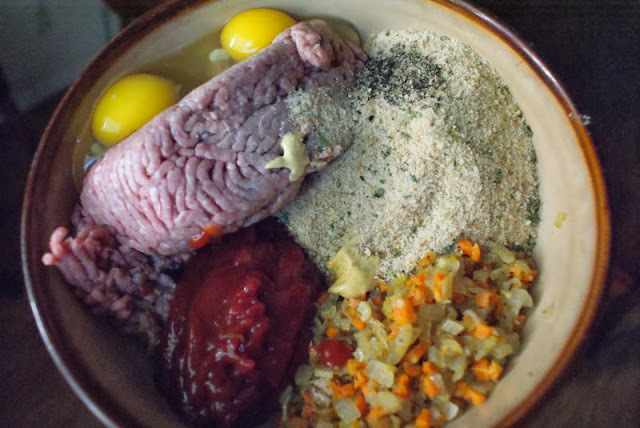 Meatloaf rocks! Know who doesn't like meatloaf in my house? My husband. Don't ask me why, because he usually likes meals made with beef. He kind of throws a little fit just like that kid in the movie whenever I say meatloaf is on the menu. 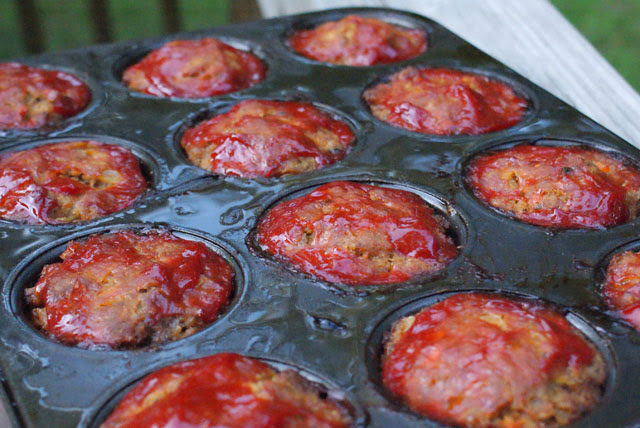 That is, unless I make these Meatloaf Muffins. These little babies are so moist and so flavorful. I love that there are fresh veggies chopped up and added to the mix! But, you know what the best part is? They cook in less time than a traditional loaf, which means they're perfect for a weeknight dinner. Your family is going to love these! 1. Preheat your oven to 350°. Heat the olive oil in large skillet over medium high heat and saute the onions, carrots, oregano and garlic for 2-3 minutes. Remove the veggies from the pan and set aside to cool. 3. 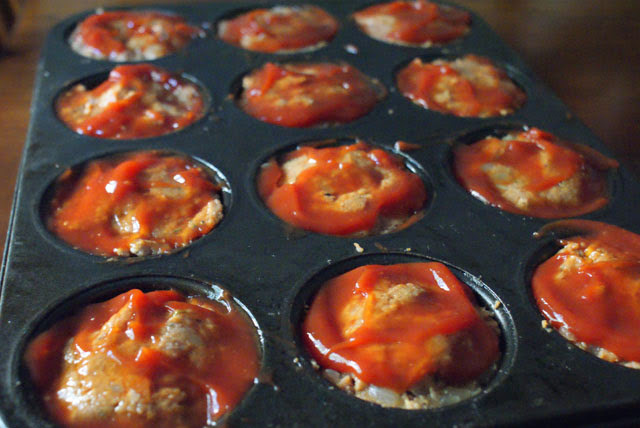 Spray a 12-cup muffin tin with cooking spray and fill the cups with the meat mixture. Top each of the muffins with 2 teaspoons of ketchup. Shared for Thursday's Treasures over at Recipes For My Boys. Much like my recipe for regular meatloaf. Try using either Ritz crackers or Captains Wafers instead of saltines and mix up a day ahead of time and let it sit in the fridge overnight before baking. Now that you mention it, I'm pretty sure I've used Ritz for these before. Love the idea of preparing them ahead of time! I am making these tomorrow. Do they freeze well. Perfect portions for my parents and grand kids. You don't say what temperature to bake the meatloaf at. We tried this recipe out for dinner a couple weeks ago. It was so good we're keeping it, and also having it again tonight! Thanks for sharing it!! Yay! I'm glad you think it's a keeper! Hi Lori! These are roughly 450 calories for 2 muffins. That would be using 85% lean ground beef. You could always use leaner beef or ground turkey to cut back on the calories. I have all the ingredients to make this except the carrot. Do you think it'll be okay without or is it worth running to the store to get? I think you could make them without. I'd add more onion in its place though. Do you know of a way to make them wheat, egg and gluten free? My lil girl cant have them! You could try subbing crushed corn chex for the breadcrumbs and flax eggs for the eggs, maybe? I've never tried subbing ingredients, so if you do, let me know how it works out! They make gluten free bread crumbs and crackers, or you could use crumbs of udi's or another gf bread. I'm not much help with the egg, we have to avoid gluten, but no other allergies. I believe there are some pretty good substitutes out there. Hi krystal! These are roughly 450 calories for 2 muffins. Hi there. I was just wondering if I froze these, do you suggest I do it with the ketchup topping on or wait till I pull them out of the freezer for reheating? Thank you for your help and for sharing this great recipe. I'm inclined to say I'd freeze them with the ketchup on, but I haven't tried it. I made these tonight and my husband and I loved them! They were so fun to eat! I didn't have an onion, so I substituted celery, which worked out just fine. Hi I would like to make these tonight for dinner. I don't have a muffin tin., what would be the substitute? You could make them as small muffin sized patties and bake them on a baking sheet! I haven't tried it, but it should work just fine. If you made one big loaf, you'd have to adjust the cooking time.